They also need $20 gift cards for the turkey or ham and any perishable food items. You can donate the gift card or donate on our website www.liftupatlanta.org. 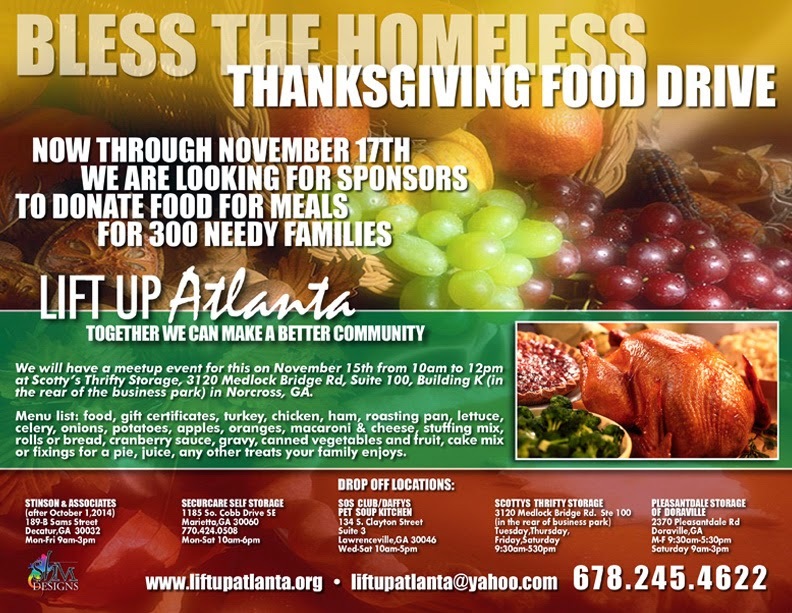 Lift Up Atlanta is in need of medium boxes and bags for the Thanksgiving "baskets". Please donate if you have them. Volunteers are also needed to help sort, organize and distribute to the families on November 15th at Scotty's Thrifty Storage, 3120 Medlock Bridge Rd, Suite 100, Building K (in the rear of the business park), Norcross, GA.
You can sponsor one family or just donate whatever you can to make the basket. You can either drop off your items at their sorting party at Scotty's Thrifty Storage, 3120 Medlock Bridge Rd, Suite 100, Building K (in the rear of the business park), Norcross, GA for sorting and distribution or drop off at one of the following locations beforehand.